The supramolecular self-assembly formed between cyclodextrins (CDs) and polymers has inspired interesting development of many novel supramolecular hydrogels as injectable delivery systems for sustained drug or gene release due to their thixotropic nature, thermoreversible properties, and biocompatibility. A large number of supramolecular hydrogels have been formed between CDs and poly(ethylene oxide) or its block copolymers with a hydrophobic segment. The intermolecular interactions by the hydrophobic blocks further strengthen and stabilize the supramolecular network, opening up a new approach for designing long-term sustained delivery systems. 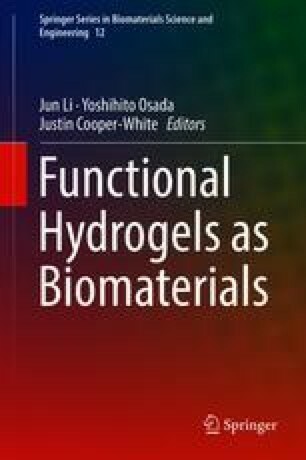 Recent advances in this field have greatly improved the rheological and delivery properties of the supramolecular hydrogels, making them more suitable for biomedical applications. Novel supramolecular structures based on pseudoblock copolymers formed by host-guest inclusion complexation with new stimuli-responsive properties have also been developed, forming “smart” supramolecular hydrogels with more desired and promising properties for controlled release applications.